Designed to solve the olive's perennial problem: Where to put the pits? Designed to solve the olive's perennial problem: Where to put the pits? Fill the ceramic server with your favorite olives—pimento, kalamata, the delicious little wrinkly ones—and hide unsightly pits in the removable compartment, which hooks onto the bowl. Gone is the separate, all-too-familiar "pit bowl", and in its place is a modern design that's easy to clean and sure to make other snack servers green (and black) with envy. Designed by Thomas Both. Handmade in Mexico. After working for a few years as a mechanical engineer out of college, Thomas felt the need to feed his right brain, and so he enrolled in design school at Stanford University and went on to teach at the Hasso Plattner Institute of Design. When creating his ceramic pieces, no functional detail is left untested. “I work much more as a designer now than an engineer,” he says, “but both play a part.” Gorky Gonzalez was born in the city of Morelia, Michoacan. His main interest has always been rescuing the traditional majolica, a lost craft of the Guanajuato region. In the process, Gorky met Hisato Murayama, a profound connoisseur of pottery technique who encouraged him to continue his studies in Japan. There, he not only learned diverse pottery techniques like Shigaraki and bizen-Yaki, but also met his wife, Toshiko. In December 1992, Gorky was awarded the National Award of Arts and Tradicional ¨for his exceptional contribution to Mexican Folk Art." Designed to solve the olive’s perennial problem: Where to put the pits? 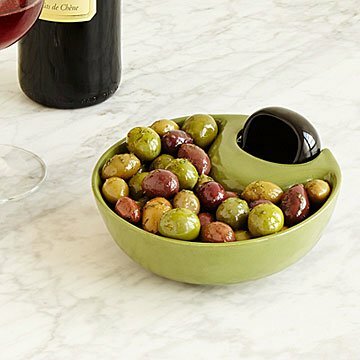 Fill the ceramic server with your favorite olives—pimento, kalamata, the delicious little wrinkly ones—and hide unsightly pits in the removable compartment, which hooks onto the bowl. Gone is the separate, all-too-familiar “pit bowl”, and in its place is a modern design that’s easy to clean and sure to make other snack servers green (and black) with envy. Corrugated boxes are made from recycled materials and recyclable. Recyclable bubble wrap is used to protect the pieces. There's one place—and only one place—where you'll find the Olive Server & Pit Bowl: UncommonGoods. I think the concept is great as pits from cherries typically end up on napkin or a drinking cup when my husband & I eat them, but two pieces (the cherry bowl & pit cup) do not assemble very easily (have to maneuver to get to fit properly), then bowl portion doesn't sit flat on surface- just the pit bowl portion, so doesn't feel stable. Would have given 5 stars if the 2 bowls could stay together while using. My Dad said it doesn't stay together when you try to move it. His suggestion is to have it 'click' into place or something like that so you can pick it up or slide it over without its coming apart. He said it shouldn't be hard to take apart but it should stay together if you slide it over on the table. Not something you see everyday. Most of our friends eat olives and this is a great solution for a pit problem. This serves olives in a fun and practical way. This bowl is very nice looking. I love that the pits are hidden. It was a perfect gift for an olive lover. Used this item at Thanksgiving and know I will use it often, especially when entertaining! Product is cool. Place for the olives and separate spot for the pits. Nice for entertaining. Only downside is you have to be careful because it is two separate pieces.